February's native plant workshop, held this past Sunday, was like one of those White Tornado commercials from the 60s, a whirlwind of clean energy zipping through the Mountain Lakes greenhouse, putting everything in order. Pots were stacked, space was cleared for growing the coming season's wildflowers, and Kim led a project to render the unlatchable greenhouse door once again safe and functional. 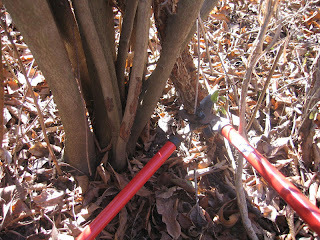 Prior to the cleanup, we had walked up the long driveway, identifying woody plants as we went. Everyone got up to speed on distinguishing native spicebush from exotic shrub honeysuckle and multiflora rose. And then we started identifying trees by their bark and form. Shagbark hickory lived up to its name, the walnut bark was dark with deep furrows, the red oaks had flat, gray "ski tracks" running down the trunk, and a Kentucky coffee tree had gray "potato chips" flaring out. There were also some very impressive black cherries, pignut hickories and silver maples. Tiny red spots on the pavement proved to be fallen flowers from the silver maples, which get an early start on spring. Susy of the Whole Earth Center provided cider and cookies. There were nine of us, all told. Thanks to all! -- These native plant workshops are sponsored by Friends of Princeton Open Space and the Whole Earth Center. 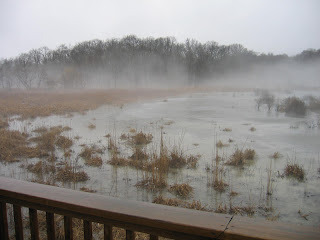 A misty morning at Rogers Wildlife Refuge in Princeton. This observation deck looks out on a great diversity of native plant and birdlife . The relatively dry ground the deck stands on, however, is dominated by invasive shrubs like multiflora rose, honeysuckle and privet. This past Sunday, we cut these exotic shrubs at the base with loppers, covering about a half acre of territory in a couple hours. The marsh has few enough of these exotic shrubs that there's a chance we can cut them all down before spring, making more room for native species and greatly reducing the seed source these exotic fringe areas represent. Thanks to Owen and Kathy for their help! This past year, the Friends of Princeton Open Space received a grant from the federal government's Wildlife Habitat Incentive Program (WHIP) to restore four acres of habitat in Mountain Lakes Preserve. The initial phase of the restoration involves removing the intimidating architecture of invasive shrubs from the chosen locations in the preserve. 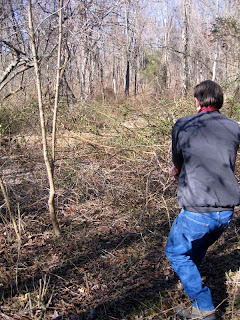 Recently, volunteer Michael Arntzenius and I took advantage of the cool winter weather to take on the dense growth of exotic multiflora rose, privet and shrub honeysuckles growing around a springfed marsh. When confronting a ten foot-high wall of invasive shrubs, some of which are well-armed with thorns, one helpful motivation is the liberation of the native species partially buried in the invasive tide. Here is a particularly satisfying situation, in which a native red chokeberry can be relieved of competition from the invasive multiflora rose growing up, through and over it (cluster of native stems to the left in photo). Just two strokes of the loppers shifts the balance, allowing the native to lay claim to sunlight and soil moisture in the coming growing season. After some struggle, and a few encounters with the business end of the rose bushes' armor, we cleared a pathway along the edge of the marsh, which has remained hidden behind the thorny wall for decades. 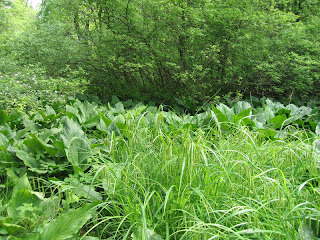 Here's how the marsh looks in late May, with fringed sedge, skunk cabbage, winterberry thriving in the springfed opening. Per usual, the wettest areas are dominated by natives, with the exotics having the upper hand around the fringe. During the Sunday workday at Mountain Lakes on Feb. 10, we were treated to a command performance of rapid mood swings by the weather. Clouds gathered, then scattered, the wind roared through the treetops, then settled down; finally, snow began to fall, dusting the valley in white. Through all of this, we continued working down the small valley, pulling up the smaller invasive shrubs and cutting the bigger ones at the base, expanding on the work done the week prior. Some of the larger exotic shrubs--honeysuckles and privets--were left standing for later cutting into sections that can be used to "corduroy" the muddy trail running past the worksite. Thanks to Steven, Russ, Brownlee, Cynthia, Annarie and her daughter and son, and Kathy for all their help. 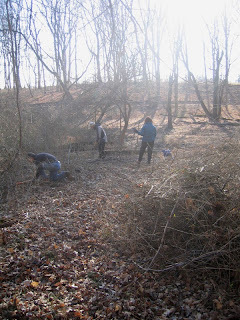 Another habitat restoration session is planned for this Sunday, Feb. 10, at 2pm. To participate, drive up the driveway at 57 Mountain Ave in Princeton, and park in the gravel parking lot. Please wear work clothes, leather gloves, and bring tools if you have them. Bowsaws, loppers, pruning shears, clippers--any of these would be useful, though I have a few extras. Below is an account of what transpired last weekend. This past Sunday's workday at Mountain Lakes was very productive. The "winter" weather (sunny, 45 degrees) and soft soil proved perfect for pulling out hundreds of small honeysuckle and privet shrubs that have been invading the valley. We left the two or three native shrubs in the mix (red chokeberries), and noticed many sedges and a few Christmas ferns ready to respond to the new dose of sunshine they'll receive now that the invasives are removed. One not-too-invasive exotic, wineberry, was left in place, the idea being that we'll control it by eating its raspberry-like berries in the summer. 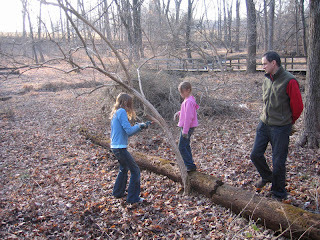 In this photo, the adults stand back as the kids take on an invasive honeysuckle shrub.